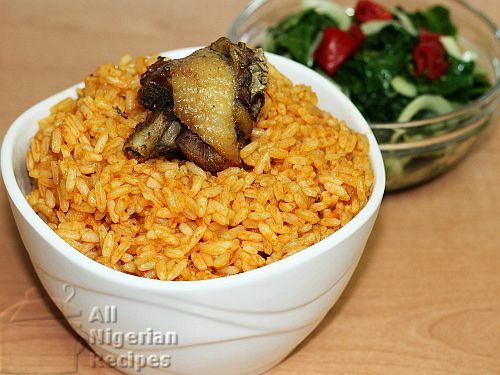 This Nigerian food is called the Jollof Rice with a twist! It feels good to see the looks on your guests' or friends' faces when they think you are serving them the good old Jollof Rice but bam, the moment the first spoon enters the mouth, you are sure to get the looks of pleasure! It makes you feel good, doesn't it? Yes, it looks the same as the Jollof Rice you know but the aroma and taste is different. Why don't you surprise your guests tonight by preparing this easy dinner recipe? This recipe is for Jollof Coconut Rice, there's another version of coconut rice known as the White Coconut Rice. Prepare the tomato stew if you don't have some in the freezer. Visit the Tomato Stew page for details on how to do that. It is advisable to prepare tomato stew before hand and keep in the freezer. This is so that whenever you want to cook any jollof rice related dish, it is just a matter of adding it to your cooking. If you will use whole chicken, wash and cut the whole chicken into pieces. Place the pieces in a pot; add water till it just covers the pieces of chicken, add the chopped onions, stock cubes and thyme and start cooking. The cooking time depends on the type of chicken. The rooster or cockerel cooks much faster than the hen but the hen is tastier. Cooking till done and add salt to taste. Put the pieces of chicken in a sieve to drain, then fry with vegetable oil. You can also grill it in an oven. This is to give it a golden look which is more presentable especially if you have guests for dinner. Read how to season and grill chicken for more one this. Now is the time to extract the coconut milk. This is quite an easy task if you follow the procedure detailed in How to Extract Coconut Milk. Set the coconut milk aside. Parboil the rice using the method detailed in parboiling rice for cooking coconut rice. Wash the parboiled rice and put in a sieve to drain. Now we need a pot big enough to accommodate the rice till it is done. Bear in mind that the rice will normally rise by at least one quarter of its quantity from the parboiled state to the done state. Pour the chicken stock, coconut milk and the tomato stew into the selected pot. Set on the stove to boil. Add the drained parboiled rice, salt and pepper to taste. 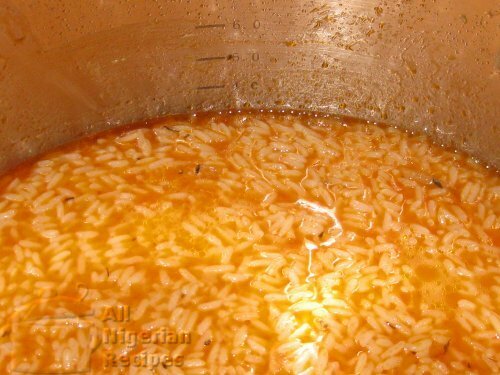 If necessary, top up with water to bring the water level to the same level as the rice. This is to ensure that all the water dries up by the time the rice is cooked. Cover the pot and leave to cook on medium heat. This way the rice does not burn before the water dries up. If you parboiled the rice as described at parboiling rice for cooking coconut rice, the rice should be done by the time the water is dry. Confirm that the rice is done by tasting it. That's the way coconut rice is cooked. If you have any questions about preparing Coconut Rice, click here to ask me.